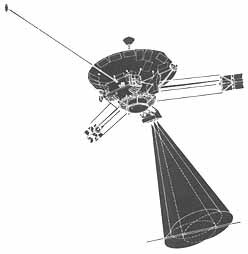 THE SCIENTIFIC PAYLOADS of both Pioneer 10 and Pioneer 11 are designed to gather new knowledge on interplanetary space beyond Mars and on the Jovian system. Basically, several science instruments measure particles, fields, and radiation, while an imaging photopolarimeter provides spin-scan imaging and analysis of scattered light. Additionally, the spacecraft's radio signal is used to measure the Jovian gravitational fields, and to investigate the atmospheres of Jupiter and its satellites. Maps the magnetic field in interplanetary space. Determines how the solar wind changes with distance from the Sun. Searches for the transition region of the heliosphere the region where the influence of the Sun on interplanetary space terminates. Measures the amount of neutral hydrogen - un-ionized hydrogen atoms - in interplanetary space and at Jupiter. Ascertains the distribution of dust particles in interplanetary space. Determines the size, mass, flux, and velocity of small particles in the asteroid belt and thus provides information on the possible hazard to a spacecraft passing through this belt. Maps the Jovian magnetic field: its intensity, direction, and structure. Determines how many electrons and protons of various energies are distributed along the trajectory of the spacecraft through the Jovian magnetosphere. Searches for auroras in the polar atmosphere of Jupiter. Obtains information to help interpret the observed characteristics of the two main types of radio waves from Jupiter, decimetric and decametric. Figure 4-1. Each Pioneer carries eleven science experiments. Maps the interaction of the Jovian system with the solar wind. Measures the temperature of Jupiter's atmosphere and of some of the large Jovian satellites. Determines the structure of the upper atmosphere of Jupiter where molecules become electrically charged to form an ionosphere. Maps Jovian thermal structure by measurement of infrared radiation. Obtains spin-scan images of Jupiter in two colors during the encounter sequence and close up images of special planetary features, and makes polarimetry measurements of Jupiter and some of its large satellites. Probes the Jovian atmosphere with S-band radio waves at occultation: similarly probes the Galilean satellite Io to investigate its atmospheric characteristics. Investigates as many as possible of the Galilean satellites at close range by spinscan imaging and other measurements to aid in determining their size and physical characteristics. Determines more precisely the masses of Jupiter and its four large satellites by accurate observation of the effects of their gravitational fields on the motion of the spacecraft. Provides information to calculate with greater accuracy the orbits and ephemerides of Jupiter and the Galilean satellites. Eleven scientific instruments (Figure 4-1) were selected from over 150 proposals submitted to NASA Headquarters in response to the announcement of the Pioneer Jupiter flight opportunity. These instruments, and two non-instrumented experiments, are described below. Magnetic fields affect the plasma of electrically charged particles in interplanetary space and control the flow of this plasma as it spreads out from the Sun across the orbits of the planets. 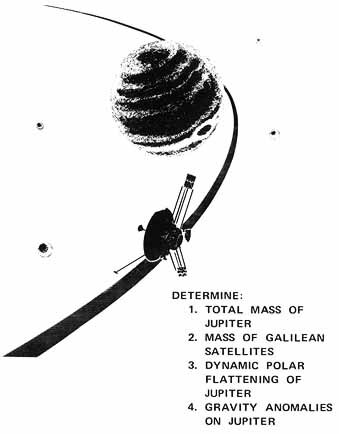 Before the mission of Pioneer 10 these effects had been only observed and measured out to the orbit of Mars. Scientists were still uncertain about many specific details about the interplanetary medium and particularly the extent to which the Sun's magnetic field controlled the flow of plasma beyond Mars to the outer regions of the Solar System. The outer boundaries of this influence were, and still are, vague, and interactions between the plasma and fields of the Solar System and those of the Galactic System still puzzle scientists. 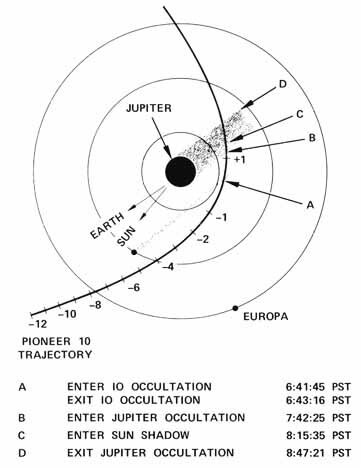 Pioneer 10 and Pioneer 11 will continue to explore the regions beyond the orbit of Jupiter and will make measurements that will help define the transition region of solar influence (heliosphere). The principal investigator for this experiment is Edward J. Smith, Jet Propulsion Laboratory, Pasadena, California. Coinvestigators are: Palmer Dyal and David S. Colburn, NASA-Ames Research Center, Mountain View, California; Charles P. Sonett, University of Arizona; Douglas E. Jones, Brigham Young University, Provo, Utah; Paul J. Coleman, Jr., University of California at Los Angeles; and Leverett Davis, Jr., California Institute of Technology, Pasadena. This experiment uses a sensitive magnetometer (Figure 4-2) at the tip of a lightweight boom, which extends 6.6 meters (21-1/2 feet) from the center of the spacecraft to reduce the effects of even the minute residual spacecraft magnetic field, and to assist the balance of this spin stabilized spacecraft. The helium vector magnetometer measures the fine structure of the interplanetary field, maps the Jovian field, and provides field measurements to evaluate solar wind interaction with Jupiter. The magnetometer operates in any one of eight different ranges, the lowest of which covers magnetic fields from ±0.01 to ±4.0 gamma; the highest fields up to ±140,000 gamma; i.e., ±1.4 Gauss. Figure 4-2. The magnetometer, mounted on a long boom to keep it far away from the RTGs measures magnetic fields in space and in the vicinity of Jupiter. 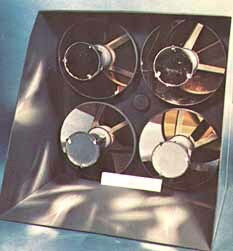 The electronics at the left of the magnetometer are mounted in the spacecraft. (The surface field of the Earth is approximately 0.5 Gauss.) 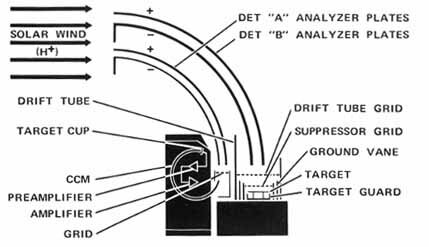 The ranges are selected by ground command or automatically by the instrument itself as it reaches the limits of a given range. The sensor for the magnetometer consists of a cell filled with helium that is excited by electrical discharge at radio frequencies and infrared optical pumping. Changes in helium absorption caused by magnetic fields passing through the magnetometer are measured by an infrared optical detector. The principal investigator for this experiment is John H. Wolfe of NASA-Ames Research Center, with coinvestigators John Mihalov, H. Collard, and D. D. McKibbin of NASA-Ames Research Center; Louis A. Frank, University of lowa, lowa City; Reimar Lust, Max Planck Institut fur Physik und Astrophysik, Garching, Germany; Devrie Intriligator, University of Southern California; and William C. Feldman, Los Alamos Scientific Laboratory, New Mexico. The solar wind of highly ionized. electrically charged particles continually sweeping out into interplanetary space from the Sun affects electrical and communications systems on Earth and may give rise to long-term weather cycles. This wind was unknown until spacecraft began to explore space beyond the Earth's magnetosphere less than 15 years ago. Some of the charged particles of the solar wind become trapped in radiation belts by the Earth's magnetic field. They also account for the aurora borealis and aurora australis and other phenomena which baffled scientists until the radiation belts were discovered by experiments carried on Earth satellites. How the solar wind behaves at great distances from the Sun was highly conjectural before the flight of Pioneer 10. Instruments on spacecraft had only measured the wind as far as the orbit of Mars. 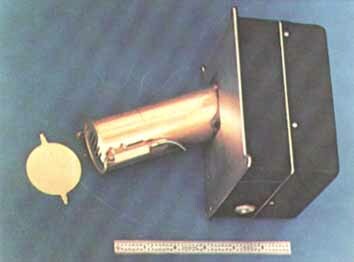 The instrument carried by each spacecraft to evaluate the solar wind to the orbit of Jupiter and beyond is a plasma analyzer that looks toward the Sun through a hole in the spacecraft's large dish-shaped antenna (Figure 4-3). The solar wind enters the plasma analyzer apertures between 2 quadraspherical plates where the direction of arrival, the energy (speed), and the number of ions and electrons making up the solar wind are measured. The instrument has a high resolution and a medium resolution analyzer to detect particles of different energy Ievels. Energies of these particles are described in terms of units called electron volts (eV). A voltage is applied across the quadraspherical plates in a maximum of 64 steps, at a rate of one step per spacecraft revolution, to count particles in discrete energy ranges. Direction of particle travel is found from the way the instrument is pointed and from the particular target within the instrument that detects it. The high resolution analyzer has 26 continuous channel multipliers (CCM) to measure the number of ions per second between 100 and 8,000 electron volts. The medium resolution analyzer has five electrometers to count ions of 100 to 18,000 electron volts and electrons of 1 to 500 electron volts. Figure 4-3. A plasma analyzer peers through a hole in the large dish-shaped antenna to detect particles of the solar wind originating from the Sun. 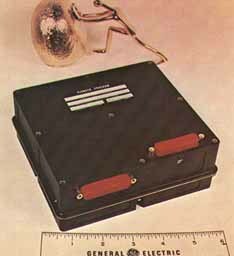 (a) Shows the instrument in diagrammatic form. (b) Shows it ready for installation in the spacecraft. Principal investigator for this experiment is John A. Simpson, University of Chicago. Coinvestigators are Joseph J. O'Gallagher, University of Maryland, College Park, and Anthony J. Tuzzolino, University of Chicago. Figure 44. Charged particle detectors are used to study the life history of cosmic rays in the Solar System. Figure 4-5. A combination of cosmic ray telescopes seeks further information on the composition of the cosmic ray particles and their energy ranges. The charged particle detector (Figure 4-4) has four measuring systems: two particle telescopes that operate in interplanetary space, and two that measure the intense trapped electrons and protons inside the Jovian radiation belts. During the interplanetary phase of the mission, before and after encounter with Jupiter, the experiment sought to identify the chemical elements hydrogen, helium, lithium, beryllium, boron, carbon, and nitrogen, and to separate hydrogen, deuterium, helium-3 and helium-4 in an attempt to differentiate between particles coming from the Sun and those from the Galaxy. The instrument is also used to determine how the streams of high energy particles from the Sun travel through interplanetary space. The main telescope of seven solidstate detectors measures the composition of cosmic rays from 1 to 500 million electron volts (MeV), and a three-element, low energy telescope measures 0.4 to 10 MeV protons and helium nuclei. Two new types of sensors were developed to cope with the extremely high intensities of trapped radiation in the magnetosphere of Jupiter. A solidstate electron current detector, operating below -40° C (-104° F), detects those electrons above 3 MeV that generate the decimetric radio waves emitted from Jupiter. A trapped proton detector contains a foil of thorium which undergoes nuclear fission when impacted with protons above 30 MeV, but is insensitive to electrons. Frank B. McDonald, NASA-Goddard Space Flight Center, Greenbelt, Maryland, is principal investigator for this experiment, with coinvestigators Kenneth G. McCracken, Minerals Research Laboratory, North Ryde, Australia; William R. Webber and Edmond C. Roelof, University of New Hampshire, Durham; and Bonnard J. Teegarden and James H. Trainor, NASA-Goddard Space Flight Center. 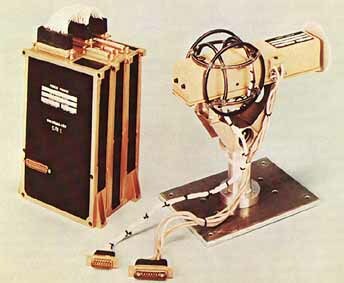 The cosmic ray telescope used for this experiment (Figure 4-5) is also designed to monitor solar and galactic cosmic rays and track the twisting  high energy particles from the Sun. The instrument can determine which of the nuclei of the ten lightest elements make up these cosmic ray particles. Before saturation by radiation, the cosmic ray telescope measured high energy particles in Jupiter's radiation belts. The instrument consists of three, three-element, solid-state telescopes. The high energy telescope measures the flux of protons between 56 and 800 MeV. The medium energy telescope measures protons with energies between 3 and 22 MeV, and identifies the ten elements from hydrogen to neon. The low energy telescope measures the flux of electrons between .05 and 1 MeV, and of protons between .05 and 20 MeV. Principal investigator for this experiment is James A. Van Allen, University of lowa, Iowa City. A Geiger tube telescope characterizes Jupiter's radiation belts using seven Geiger-Muller tubes to survey the intensities, energy spectra, and angular distributions of electrons and protons along the spacecraft's path through the radiation belts of Jupiter. The instrument is shown in Figure 4-6. Each tube is a small gas filled cylinder. When a charged particle passes through the gas, an electrical signal is generated. Three parallel tubes form a telescope. Three others form a triangular array to measure the number of multi-particle events called showers. The combination of telescope and shower detector compares primary and secondary events in the Jovian radiation belts. The third telescope detects low energy electrons above 40 keV. The instrument also counts protons with energies above 5 MeV and electrons with energies from 2 to 50 MeV. Figure 4-6. Other telescopes are used to explore the radiation belts of Jupiter, measuring electrons and protons in these belts. ....electrons and protons. Principal investigator is R. Walker Fillius, University of California at San Diego, with Carl E. McIlwain of the same University as coinvestigator. The greater range of this instrument is obtained through use of several different kinds of detectors. An unfocused Cerenkov counter detects the light emitted in a particular direction as particles pass through it. It records electrons of energy 0.5 to 12 MeV. An electron scatter detector is activated by electrons at 100 to 400 keV. Figure 4-7. The radiation is further explored over an even broader range of energies by a trapped radiation detector. .....measures minimum ionizing particles (i.e., less than 3 MeV) and protons in the range of 50 to 350 MeV. Different sensitive materials in two scintillation detectors distinguish roughly between electrons of less than 5 and protons of less than 50 keV. These five different "eyes" of the instrument (Figure 4-7) provide basic information about several of the fundamental features of Jupiter's radiation belts including the types of particles within the belts' their distribution, energy, and intensity. This investigation consists of two distinct experiments using different experimental techniques; one to detect light reflected from particles, the other to detect impact of particles. Principal investigator for the first experiment is Robert K. Soberman, General Electric Company, Philadelphia, whose coinvestigator is Herbert A. Zook, NASA-Manned Spacecraft Center, Houston, Texas. The instrument (Figure 4-8) consists of four non-imaging telescopes that detect sunlight  reflected from meteoroids passing through their fields of view. Each telescope has a 20 cm (8-inch) diameter primary mirror, secondary optics, and a photomultiplier tube that converts light to electrical signals. When a particle passes through the telescope's 8-degree field of view, reflected light is detected by the photomultiplier tube. The four telescope's fields of view overlap slightly. If a particle is "seen" simultaneously by any three of the telescopes an event is recorded. From this data the particle's distance, trajectory, velocity, and relative size may be calculated. These telescopes are capable of detecting objects ranging from distant asteroids miles in diameter to minute sunlit particles of dust several feet from the telescopes. The second experiment has William H. Kinard, NASA-Langley Research Center, Hampton, Virginia, as principal investigator. Coinvestigators are Jose M. Alvarez, Robert L. O'Neal, Donald H. Humes and Richard E. Turner, also of NASA Langley Research Center. Figure 4-8. A meteoroid-asteroid detector looks into space with tour non-imaging telescopes to track particles ranging from close-by bits of dust to distant large asteroids. Shows (a) the electronics, (b) the four non-imaging telescopes, and (c) how this experiment is mounted on the spacecraft. Figure 4-9. Twelve panels of pressurized cells mounted on the back of the main dish antenna record penetrating impacts of small meteoroids. Shows (a) one panel, (b) its electronics, and (c) how the panels were mounted behind the antenna. 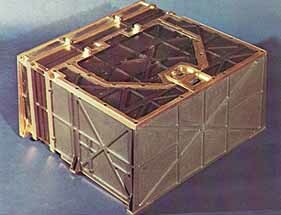 The meteoroid detector consists of 13 panels, each containing 18 sealed cells pressurized with argon and nitrogen. These panels cover 0.605 square meters (6.5 square feet) of the back of the main antenna dish (Figure 4-9). When a cell is punctured by particulate matter in interplanetary space it loses gas at a rate proportional to the size of the hole made in the tube. The experiment indicates penetration by meteoroids having masses of one billionth of a gram and larger. 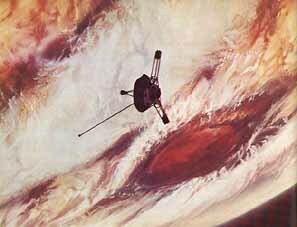 Panels on Pioneer 11 are made up of cells with thicker wall material to detect particles of greater mass. 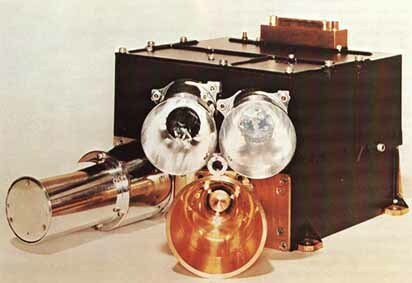 This ultraviolet photometer (Figure 4-10) investigates the ultraviolet reflective properties or emission from interplanetary hydrogen, helium and dust, and from Jupiter's atmosphere and satellites. Its principal investigator is Darrell L. Judge, University of Southern California, Los Angeles, with Robert W. Carlson of the same university as coinvestigator. Radiotelescopes have shown that the Solar System is immersed in and traveling through an interstellar gas of cold, neutral (uncharged) hydrogen. 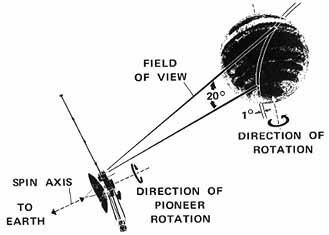 By measuring the scattering of the Sun's ultraviolet light in space the Pioneer instrument seeks to measure the amount of this neutral hydrogen within the heliosphere. Presence of such neutral hydrogen (already measured near Earth) could be the result of neutralization of fast solar wind hydrogen ions at the heliosphere boundary, their conversion into fast uncharged hydrogen atoms, and their diffusion back into the heliosphere. Or they may be coming in from the Galaxy itself; penetrating the Solar System as a result of the system's 73,000 km/hr (45,000 miles per hour) velocity through the interstellar gas. Figure 4-10. Ultraviolet light is sensed by this ultraviolet photometer to determine the quantities of hydrogen and helium in space and on Jupiter. (a) Is a photograph and (b) a diagram of the instrument. (c) Shows how it scans Jupiter. ...confirm or deny the "big bang" theory-a single creative event rather than continuous creation - for the origin of the universe which postulates seven percent helium in the interstellar gas. 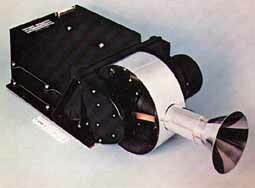 The ultraviolet photometer has a fixed viewing angle and uses the spin of the spacecraft to scan around the celestial sphere. When close to Jupiter, the photometer scans the medium above the cloud tops. 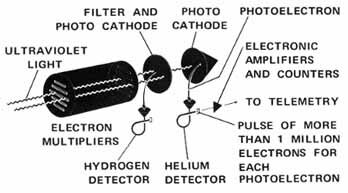 By measuring the changes in the intensity of ultraviolet light reflected into two photocathodes of the instrument one measuring radiation at 1216 Angstroms, the other at 584 Angstroms the photometer detects light from hydrogen and helium respectively. Within the Jovian system the photometer measures the scattering of solar ultraviolet light by the atmosphere of Jupiter. This scattering provides information on the amount of atomic hydrogen in Jupiter's upper atmosphere, the mixing rate of Jupiter's atmosphere, the amount of helium there, and therefore the ratio of helium to hydrogen at Jupiter. Virtually all theories of Jupiter's origin and development make assumptions about the amount of helium in the planet's atmosphere, but prior to Pioneer 10's mission helium had not been identified at the planet. By measuring changes in the ultraviolet light glow the instrument checks to see if Jupiter has polar auroras, bright glowing parts of the upper atmosphere caused by concentration of particles along magnetic field lines from space towards the poles of the planet. Infrared emissions from Jupiter have been measured successfully from Earth. Maps of the planet at this wavelength have been made and show belts and bands similar to visible light pictures. But most of the planet's infrared radiation is emitted at 20 to 40 micrometers and these wavelengths can be observed effectively only by a spacecraft since the Earth's atmosphere readily absorbs them, blocking the 40 micrometers region entirely. 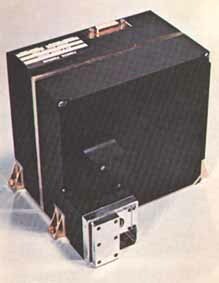 The infrared radiometer is designed to measure radiation from Jupiter at 20 and 40 micrometer wavelengths. Principal investigator is Guido Munch. California Institute of Technology; his coinvestigators are Gerry Neugebauer, also of Caltech; Stillman C. Chase, Santa Barbara Research Center; and Laurence M. Trafton, University of Texas, Austin. Perhaps the most important question about Jupiter is its heat balance the balance between radiation emitted from Jupiter and that received from the Sun. Observations from Earth had earlier shown that Jupiter is hot enough to emit more heat than it receives. The infrared radiometer provides a more accurate measurement of Jupiter's net heat energy output. 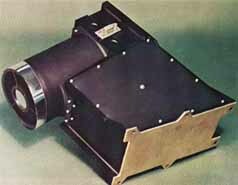 The two-channel radiometer (Figure 4-11) measures infrared radiation in the 14 to 25 and 25 to 56 micrometer wavelength regions of the spectrum. The instrument not only determines the temperature across the disc of Jupiter, but also provides important information to aid in determining the thermal structure and chemical composition of the Jovian atmosphere. Like the ultraviolet photometer, the infrared radiometer uses a fixed telescope that scans the surface of the Jovian cloud tops as the spacecraft spins about its axis. Because of the fixed viewing angle, the infrared instrument could view the planet only for 80 minutes before the time of closest approach. Designed with a 7.6 cm (3 inch) diameter Cassegrain optical system, the instrument relies upon 88 element, thin film, bi-metallic, thermopiles to detect infrared radiation. Its field of view is approximately 725 by 2400 km (450 by 1500 miles) on Jupiter's cloud surface at the time of closest approach. Figure 4-11. Infrared radiation from Jupiter provides information on cloud temperature and the output of heat from the planet in general. 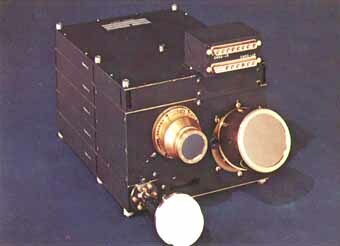 It is measured with this infrared radiometer. ....information is obtained once per minute during tracking periods. The two-way Doppler tracking data, augmented by optical and radar position data about Jupiter, are used to determine the mass of the planet from its perturbations on the path of the spacecraft. Computer calculations, based on the spacecraft's trajectory and known planet and satellite orbital characteristics, provided a five-fold improvement in the accuracy of calculation of Jupiter's mass. Masses of the four large satellites, Io, Europa, Ganymede, and Callisto were also determined to an accuracy of one percent. The experiment determined the polar flattening of Jupiter to within one half mile, and provided data to estimate the mass of surface layers of Jupiter should they exist. The experiment makes use of the spacecraft itself as a sensitive instrument affected by the gravitational field of Jupiter and its large satellites (Figure 4-12). Figure 4-12. A celestial mechanics experiment determined the total mass of Jupiter, the masses of the Galilean satellites, and the polar flattening of Jupiter. ...Jupiter and its satellite lo (Figure 4-13). Principal investigator for this experiment is Arvydas J. Kliore, Jet Propulsion Laboratory; his coinvestigators are Gunnar Fjeldbo, Dan L. Cain. and Boris L. Seidel of that Laboratory, and S. Ichtiaque Rasool, NASA Headquarters, Washington, D.C. Passage of the spacecraft's S-band radio signal through Jupiter's atmosphere for about one hour as each Pioneer swung behind the planet probed Jupiter's ionosphere and provided information on the density of the atmosphere to a pressure level of about one Earth's atmosphere. Figure 4-13. As the spacecraft flies behind lo and Jupiter, its radio signals are interrupted by the ionosphere and then cut off by the surface of lo and the dense deep atmosphere of Jupiter. But in probing through the atmosphere of these distant bodies the radio signals carry valuable information to scientists back on Earth. Structure, temperature, composition, and charged particles, can all be calculated from the effects of the atmosphere on the radio signals. .....with temperature measurements, allowed inferences to be made about the hydrogen/helium ratio in the atmosphere of the giant planet. Experimenters were also able to measure the absorption profile of the Jovian atmosphere and thereby calculate its abundance of ammonia. As the spacecraft swung behind Io, similar experiments were made to seek out and examine any atmosphere of that satellite. Io is of particular interest because it appears to affect the radio waves emitted by Jupiter itself. Figure 4-14. A special instrument observed the faint flows in interplanetary space of the Zodiacal Light, the Gegenschein, and the integrated starlight. At Jupiter this same instrument was used to look at the reflective properties of the Jovian atmosphere and of satellites and to build up spin-scan images of these bodies. Principal investigator for this experiment is Tom Gehrels, University of Arizona, Tucson. Coinvestigators are Charles Blenman, Jr., Arthur Clements. Jyrki Hameen-Anttila, Charles E. KenKnight, William Swindell, and Martin Tomasko, all of the same University; David L. Coffeen, Goddard Institute for Space Studies, New York City; Robert F. Hummer, Santa Barbara Research Center; and Jerry Weinberg and Martha Hanner of the Space Astronomy Laboratory, State University of New York, Albany. 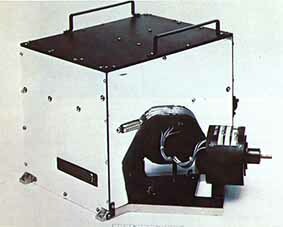 The instrument used for this experiment (Figure 4-14), which is described in detail in Appendix 1, is an imaging photopolarimeter (IPP) which operates in three different modes, differing mainly in their sensitivity and instantaneous field of view. The most sensitive mode is used during the interplanetary phase of Pioneer's mission to measure the Zodiacal Light, Gegenschein (also called counterglow), and integrated starlight from the Galaxy. This mode was not used at encounter. The other two modes gathered photometric and polarimetric data on Jupiter over a wide range of phase angles and distances, to provide new knowledge about the shape, size, and refractive index of cloud particles, and the abundance of gas above the clouds. The photometric mode also provided data that was processed by computer into images of the planet.